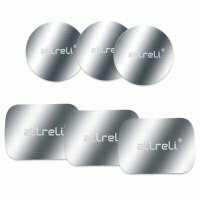 View basket “aLLreLi 6 Pack Metal Plates with Adhesive for Car Mount Phone Holder Cradle, 3 Pack Rectangular and 3 Pack Round” has been added to your basket. MOUNT IT ANYWHEREPlace the magnetic mount onto any flat surface like the dash or center console. You can also use it on your office desktop, your kitchen counter, your bedroom nightstand, your bathroom vanity or anywhere else you desire. Magnetic Air Vent Car Mount Set Your Hand Free From Your Phone: This universal air vent magnetic car mount holder gives you a clear view of your phone screen without ever having to reach for your mobile device, so you can reach your destination safely. Powerful Magnets Give Your Phone Ultra Protection: Four powerful magnets built into the mount head ensure your phone safely, even on the most bumpy roads. Non-slip silicone pad prevent the digital devices from scratching better. Gives the Perfect Viewing Angle: 360°rotation design provides the most comfortable viewing angles to avoid reflect light from the phone, there’s no any problem to watch screen. Universal Design to Fit All Smartphone: This magnetic mount holder works with iPhones, Android phones, BlackBerry phones and Windows phones alike! Whatever the size or model, our magnetic mount will keep it in place. Easy to Use: Simple and complementary design makes this air vent car mount more easily install and quickly remove to meet your need. Universal metal plates and 3M tapes can be used to universal magnetic car mount holder. 8 Packs: 4 Round metal plates with adhesive and 4 Round 3M tapes enough to meet your needs. All metal plates have 3M adhesive on the back for easily sticking and mounting. 3M Brand Tapes desire you to change the car mount in different places. Please Note: Metal plates themselves are just METAL, NOT MAGNETIC, they can work with all magnetic car phone mount holder. Univesal Metal Plates Can Be Used To Universal Magnetic Car Mount Holder. 6 Packs: 3 Rectangular And 3 Round Metal Plates Enough To Meet Your Needs. Especially Fit With aLLreLi Car Mounts. 9 Packs: 6 Metal Plates With Adhesive And 3 Round 3M Tapes Enough To Meet Your Needs.